Nicolella Roofing specializes in Flat Roofing. We recommend EPDM, and have other options available. Choose from Dozens of high end shingle options all backed by one of the industries Lifetime Shingle Warranty. Flat roofing services such as roof repair, yearly roof maintenance, retrofit systems, coatings and re roofing. Does the exterior or your home need some attention Specilaizing in Roof, Chimney or gutters repair. Custom seamless gutters created and installed onsite. Our seamles sgutter machine will create your gutters to your homes custom dimensions. 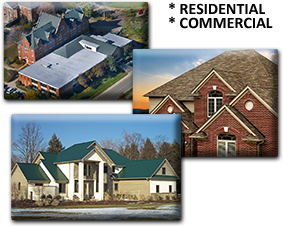 Nicolella Roofing is an established family-owned and operated residential and commercial roofing company that has been operating Washington, PA since 1968. This year we are celebrating our 48th year in operation. That is 48 years of roofinginstallation and repair experience in Washington, PA and its surrounding areas in southwestern Pennsylvania. Nicolella Roofing was started by our father, Joe Nicolella, in 1968. His main goal was to offer the highest quality installations at a fair price. Today, the company is owned and operated by his four sons, Jay, Marc, Eric, and Jeff. We work hard to continue the tradition, as we aim to offer premium quality labor and materials to our customers. Our goal is to provide you with the highest quality roof installation that will protect and enhance your home or building. You can be confident that we will stand behind our workmanship and be assured that only first-rate materials are installed according to the latest industry standards. For a sample of what we can do, take a look at some of our work on the projects page. Just give us a call at 724-223-0562 to get started. We look forward to serving all your roofing needs.